Standard - $200.99 Only 7 left! Jabba Desiligic Tiure is evil. It's probably nothing that needs to actually be said, given the fact that the guy looks like a giant evil slug monster, but we do encourage folks not to judge others by what they look like. It is a vast galaxy and there are many types of folks out there, after all! However, in the case of Jabba the Hutt, the looks do not deceive and this guy is as slimy as they come. Huge member of the Grand Hutt Council and friend to the Crymorah Syndicate and eventually a big deal of the Shadow Collective, there isn't much darkness in the world that Jabba doesn't have his pudgy fingers into. Make sure you can watch this guy's every move with this Inflatable Jabba the Hutt Decoration. This 6' by 10' inflatable creampuff will be one of the biggest sites for your local war of the stars. Fortunately, it comes with a fan that will get the guy full of hot hair without taking out your lungs. Remember, if you need to kill him to focus on strangling. Knives will be a little too permanent! Normally, it is kinda important to keep pests out of your house and yard. But, when they are giant masters of a galactic crime syndicate, sometimes, there might be a few advantages to keeping them around. 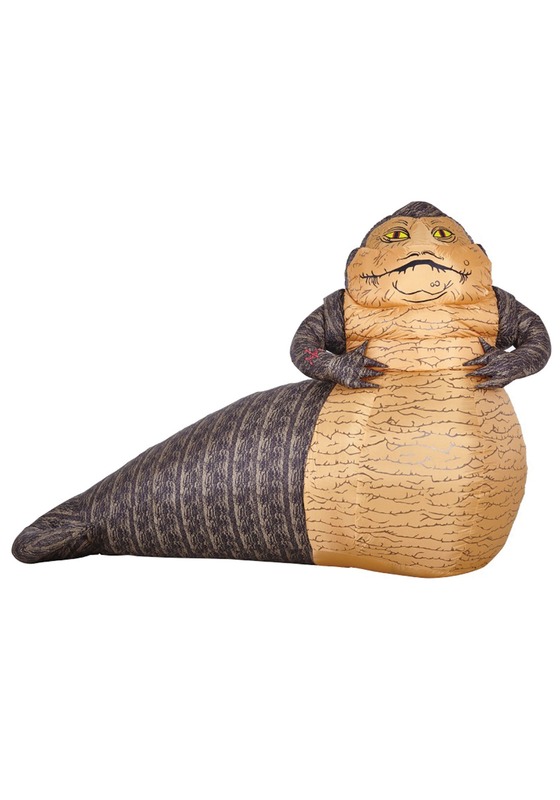 Try your luck with this Inflatable Jabba the Hutt Decoration. Warning: May attract slave girls.